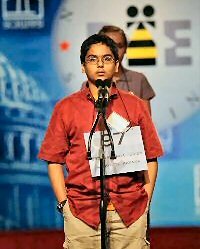 Indian-American Sameer Mishra has won the 2008 Spelling Bee competition. Sameer Mishra is a 13-year-old, 8th grade student at the West Lafayette Junior/Senior High School in West Lafayette, Indiana. The word that earned Sameer the coveted championship was “guerdon,” a noun meaning a reward. As the Bee Champion, Sameer Mishra took home $35,000 in cash, a $2,500 savings bond and other prizes. There were at least four Indian-Americans in the top 12 of the competition. The second place in the 2008 Spelling Bee went to 12-year-old Sidharth Chand, a 7th-grade student of the Detroit Country Day Middle School in Bloomfield Hills, Michigan. Kavya Shivashankar tied for the 4th place and Jahnavi Iyer tied for 8th place. Sameer loves to read and is part of his school’s book club. He enjoys playing computer and video games, as well as board games. Sameer has played the violin for four years in his school orchestra. He also likes to ride his bike and hang out with his friends. His favorite subjects are science and math. Sameer is a competitive student; he participates in contests such as Spell Bowl, Academic Super Bowl and Indiana State School Music Association. Sameer aspires to a career as a neurosurgeon. His sister Shruti, a three-year competitor in the Scripps National Spelling Bee, is his spelling coach. This is Sameerâ€™s fourth year in the competition, having previously tied for 98th, 14th and 16th places (2005, 2006, 2007). The 2008 Spelling Bee competition attracted 288 spellers from around the world. Are You Watching the 2014 Spelling Bee?